Zentimo help - How to hide an unnecessary device from the menu? Help > How to hide an unnecessary device from the menu? 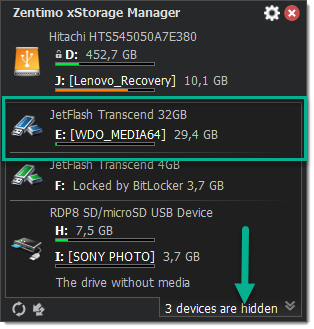 By default, Zentimo displays only storage devices in the device stopping menu, which are the devices with drive letters. Often our users want to hide some devices from the menu to prevent their accidental stopping (e.g. SATA drives that actually are not external drives). It can be done easily. 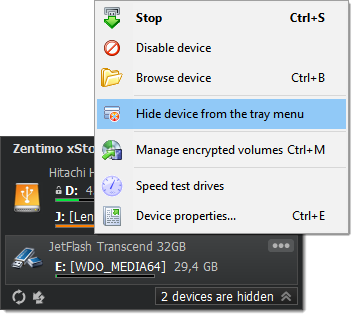 Just call the stop menu, click the "Menu" button and select "Hide device from the tray menu" item in the displayed context menu. How to show a device back in the menu? If you wish to know where's your hidden device gone just click the small "X devices hidden" button at the bottom of the menu and your hidden devices will be displayed. In order to show the device back in the menu click the menu button on the hidden device again and choose "Show device in the tray menu".